I am an experienced Consultant Obstetrician and Gynaecologist. 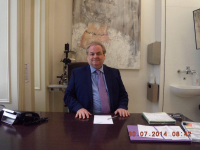 I initially worked as an NHS Consultant Gynaecologist and Academic in West London. I have been a practising Consultant for 20 years and specialise in the treatment of pelvic pain, endometriosis, heavy periods, fibroids and infertility and vaginal prolapse. I am interested in psychosomatic aspects of gynaecology including the climacteric, perimemopause and the menopause and HRT. I also offer same day emergency consultations. In 1997, I started a specialist NHS clinic helping victims of female genital mutilation. I also started to help women who were concerned about the appearance of their labia. I am interested in the impact of psychology on gynaecology, and work closely with psychologists and psychiatrists to improve the quality of my patients lives. I have been active in both clinical and science based research. I run the educational programme at the Portland Hospital. Pre-menstrual syndrome and menopause; Reconstructive vaginal and labial surgery; Minimal access and Laparoscopic surgery; Hysterectomy; Fibroids; and myomectomy transcervical resection of fibroids. endometrial ablation. NovaSure Myosure ; Ectopic pregnancy Salpingo-oopherectomies. Adhesiolysis. division of adhesions. Ovarian cysts . Painful perineum post childbirth. Repair of perineum. pelvic pain physician and investigation for pelvic pain.Surgery for vaginal prolapse and urinary incontinence. Dilation and curettage, evacuation of retained products of conception. Cystoscopies for irritable bladder. Opherectomies. Bartholin's cysts and marsupilisation. Cervical biopsies. Treatment for endometriosis. University of London Laurel 1982. Royal Society of Medicine Obstetrics and Gynaecology Registrar 1995. Overseas Doctors Association Mentor Award 2005. I am a regular contributor to the Huffington Post. I am a reviewer for several scientific journals. I carry out a very large number of vaginal procedures for both incontinence and also for constipation. I have an extremely low complication rate. In the last year, I carried out over 100 of these procedures, with no returns to theatre. Fellow of the Royal College of Obstetricians and Gynaecologists. the duty manager at the Wellington on 02075865959.
they will immediately contact me.